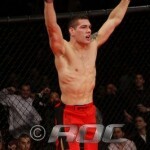 This past weekend (June 13th), former Baldwin High School, Nassau Community College, and Hofstra University great, Chris Weidman won the Middleweight title at the 2009 Abu Dhabi Combat Club East Coast trials. By virtue of his submission victory (via anaconda choke) over James Brasco, the Serra BJJ representative officially punched his own ticket to the ADCC World Championship Tournament, to be contested in Barcelona, Spain on September 26th-27th. Weidman, who possesses an undefeated (2-0) record in his young mixed martial arts career fighting for the Ring of Combat promotion, announced several weeks ago on his facebook page that he would be stepping away from MMA for a number of weeks in order to properly prepare himself for last weekend’s qualifying tournament, held in New Jersey on the campus of Brookdale Community College…Now that he has earned himself a place in the “big dance”, it is to expected that his entire training regime will continue to be focused on developing and/or refining his already excellent wrestling/grappling skills. For those of you not familiar, the Abu Dhabi World tournament is regarded by experts in the field as being the premier grappling tournament in all of the world. In fact, so prestigious is this event that it is only contested every two years. If that is not enough to convince you than how about this fact…In the past, many winners of the Brazilian Jiu-Jitsu World title have entered Abu-Dhabi and failed to emerge with the hardware…Still need more evidence? Fine. Former UFC Welterweight Champion, Matt Serra (Weidman’s coach) was only talented enough to earn the silver medal when he competed in 2001….Other big name MMA superstars to compete in the short but rich tradition of the tournament include the likes of Renzo and Royler Gracie, Dean Lister, Jeff Monson, Demian Maia, Fabricio Werdum, etc…It goes without saying that a win in Barcelona will not only place Weidman in an elite company, it would essentially make him a household name in MMA overnight. In a career that has already seen more than its fair share of athletic glory, a title at the ADCC World tournament may sit alone atop the proverbial mountain. Perhaps what is most impressive about the 2002 NYSPHSAA State Champion’s (@189 pounds) most recent feat is fact that he was able to accomplish such a notable honor despite only eight months of solid BJJ/grappling training. Connoisseurs of the sport are calling what Weidman just achieved “unheard of” in the circles that they travel…Then again; rising to the occasion is nothing new to the man accurately nicknamed, the All-American. Following an impressive scholastic career at Baldwin that commenced with an aforementioned state title, Weidman made the decision to remain loyal to his native roots, electing to compete for two years at Nassau Community College; A decision that I am sure Head Coach Paul Schmidt is appreciative of even to this day. As a member of the Lions’ Weidman was a two-time NJCAA All-American, finishing 3rd (@197) both years. But, the best still awaited him. Not one to rest on his laurels, Weidman saved the best for last as a senior for the Pride. Entering the final weekend of his collegiate career at the 2007 NCAA tournament, Weidman found himself seeded 11th. Yet, rather than sulk and accept the fate that the rankings committee had bestowed upon him, again Weidman showed why he is regarded by this journalist as the consummate “big game” competitor, winning his first three matches of the tournament to lock up his second consecutive All-American finish. While the “kid from Baldwin” would lose his semifinal bout to eventual national champion, Josh Glenn, it would be in defeat that the public truly learned the size of the beast that is Chris Weidman’s heart…His dreams of hoisting an NCAA crown abolished, Weidman, competing for nothing but Pride, reached deep down and won the final two matches of his college career to claim third place. In doing so, he played a key role in leading Hofstra University to its highest team finish in history, 7th….If you learn nothing else from this story, be sure to absorb this; When it comes to Chris Weidman, odds do not mean a thing. He is a winner in each definition of the word. Why should September 2009 prove any differently? On behalf of all of us at Lighthouse Wrestling and Long Island Wrestling fans the nation wide, CONGRATULATION CHRIS ON A HELL OF A JOB WELL DONE. BEST OF LUCK IN SPAIN !!! Note: Other winners of ADCC East Coast trials titles were Tom DeBlass (Heavyweight), Gerard Rinaldi (Middleheavywight), Enrico Cocco (Welterweight), and Jayson Patino (Lightweight)….If the name Rinaldi sounds familiar, it should. Like Weidman, Gerard “Jerry” Rinaldi was a two-time All-American. The former Cornell Big Red wrestler followed up a 4th place showing in 2006 by finishing 6th in 2007. After losing to him during the regular season, Weidman defeated Rinaldi 4-3 in the consolation semifinals in both their senior seasons. Jacob Volkmann, a former three-time All-American for J Robinson’s Minnesota Golden Gophers, was the runner-up in the welterweight decision. In 2008, Volkmann was a champion in the 88kg division at the World Grappling Tournament. He currently possesss an unblemished 9-0 record as a mixed martial artist. In winning three bouts to claim the crown, Weidman did not surrender a single point. In addition to his submission victory in the finals, Chris had wins by submission and by 12-0 decision in earlier rounds of the competition. Listen to the commentary on the James Brasco vs. Chris Weidman match in the first video. The two guys taping are obvious fans of Brasco’s, but they can’t stop themselves from being impressed with Chris’ performance. It’s nice to hear Chris made such a powerful impression on the people at the event. Congratulations Chris!